PetLondon Models were approached by Virgin Media, looking for a special dog to be filmed for their social media to promote their new on the go service.The lucky pooch chosen was Barry the pug, a happy pup who loves to meet new people and has a wide range of talents, including playing football. The shoot took place at Jet Studios in South West London, and Barry and his owners arrived with time for a quick pit stop to get an energy boost before the shoot began. Since the shoot was promoting Virgin Media’s on-the-go service, Barry posed with a range of props, including a laptop, tablet and smartphone. Barry got to walk his own pug sized red carpet, and looked the part in his wonderful tuxedo. He showed the crew his skill set, walking down the red carpet and stopping on command. Barry also showed off his remarkable footballing talents, dressed in his red tracksuit. He also lounged in a bean bag as part of the shoot, which was a well needed rest from all the walking and running! After working so hard, by the end of the day Barry was one very tired pug! By the last scene he was exhausted, and had a well deserved shut eye. The crew were so impressed with Barry they gave him a huge round of applause at the end of the shoot. Here is a clip of the final video. Keep an eye out for Barry on Virgin Media’s social networks! 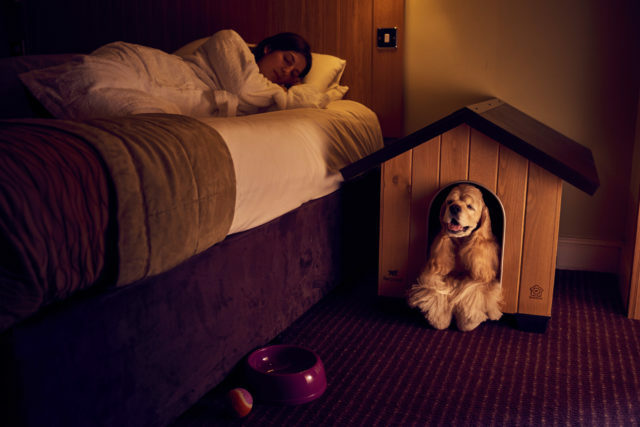 PetLondon was tasked to find some four legged friends for the launch of a new room service for dogs. The luxury hotel chain, Mercure, got in contact to find some models for the promotional photoshoot and the filming for the new Pawsome delights on offer at their Warwickshire Walton Hall Hotel & Spa. Research by the hotel brand found 33% of dog owners miss out on going away because of their pets and 41% feel guilty when they do travel. The hotel collection has introduced the Happy Tails package, masterminded by Head Pet Nutritionist at AniForte, Katrin Scholz, at selected hotels within their group. The hotel chain wanted a variety of sizes, to highlight that dogs of all sizes, ages and shapes were welcome. After much consideration, they chose four dogs. These were: Nala, the Pug, Brinkley, the American Cocker Spaniel, Pip, the West Highland Terrier & Scotty, the Golden Retriever. The filming took place across the whole hotel complex, including a group shot on the beautiful grounds. From panning group shots in the lobby to action sequences outside, all the dogs performed superbly to all the tasks at hand. I think Nala, especially enjoyed one of her filming scenes.. She told us it was the easiest day on set ever! (See photo below). Similarly, Brinkley, modelled beautifully in one of Mercure’s dog friendly room. He was definitely the perfect actor; ‘pretending’ to soundly snooze for the photograph. Every little touch has been thought of to make the stay as pleasurable for the canine companions, such as the matching dog bowl and ball that matched the carpet and bed frame. At lunchtime, all the dogs headed to the dining room to shoot the Happy Tails package. 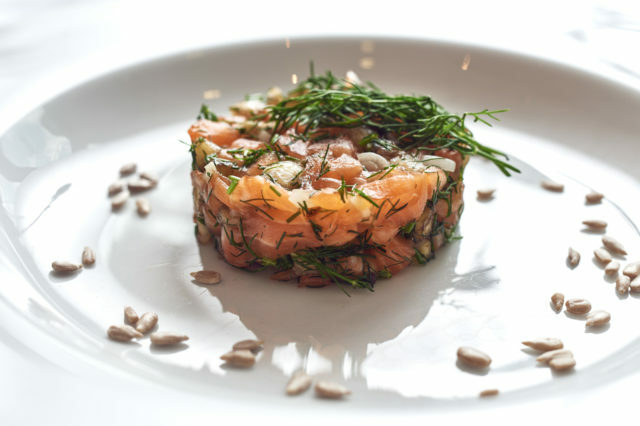 The nutritious menu had been designed just for dogs and includes salmon sashimi, beef tartar and ‘clean eating’ chicken with carrots and apples if your dog prefers to eat lighter on their holiday. Guests just need to ring in advance to check whether their chosen venue provides the service they require. More information can be found on http://www.mercurechester.co.uk/mercure-happy-tails.html. Be sure to check out the promotional video. Well done everyone!